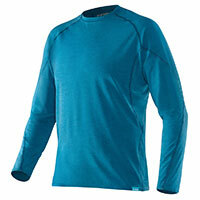 The NRS Men's H2Core™ Silkweight Long-Sleeve Shirt provides maximum sun protection, is quick-drying, and breathable. It's perfect for SUP, kayaking, rafting and other active water sports. The relaxed fit provides casual comfort by itself, and is ideal as a base layer or under a life jacket. The friction-free zones under the arms ensure comfortable paddling and rowing. And the technical fabric enhance the body's natural cooling process by wicking excess moisture for cool comfort.